Designed with streamlined installation in mind, Day & Night commercial packaged rooftop units have everything you need from handled access doors to certified and pre-engineered factory-installed options as well as field-installed accessories. Day & Night rooftop units are available in gas heating/electric cooling or packaged heat pumps and deliver SEER ratings as high as 13.4 and EER ratings up to 11.3 on standard efficiency units and SEER ratings as high as 15.8 and EER ratings up to 12.4on high efficiency models. Day & Night rooftop units have the capability for vertical or horizontal airflow for fast and easy installation. The high-efficiency gas heating (up to 82% efficiency) with induced draft design facilitated long life and safe operation. Day & Night rooftop units can easily satisfy any light commercial application need. Day & Night rooftop units utilize fully hermetic scroll compressors. Compressors are designed with internal isolation and have internal thermal line break, current overload, and high-pressure differential protection. The integrated terminal simplifies the installation of pre-engineered and certified field-installed accessories including economizers by providing clearly labeled connection points for easy plug-in connection. It is standard on every unit. Handles located on all major access panels provide quick, convenient and safe access to components for easy maintenance and service. To prevent misalignment and stripped metal panels, screws are guided into collars. The addition of these Screw Collars makes panels faster and easier to remove and install. 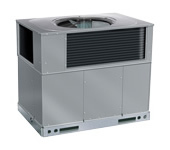 Heat pump models come standard with a refrigerant suction line accumulator in each refrigerant circuit. This preventative measure interrupts the natural tendency of liquid refrigerant from entering the compressor in heat pumps as they switch in and out of defrost and between heating and cooling modes. 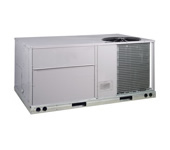 This dramatically increases the reliability of Day & Night heat pump units. 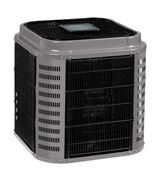 In addition, heat pump models come with high pressure and temperature protection as well as low pressure or loss of charge protection. Day & Night rooftop units were designed with streamlined installation in mind – whether for replacement or new construction. The light and compact design has full-perimeter base rails that help in moving, transporting and rigging. Day & Night models up to 12.5 tons are specifically designed to fit on many similar roof curbs dating back over 20 years which makes replacement easy and eliminates the need for curb adapters or changing utility connections. Day & Night rooftop units are capable of either vertical or horizontal airflow to meet nearly every application need. Day & Night rooftop units can be ordered with a wide range of factory pre-engineered and certified options like stainless steel heat exchangers, smoke detectors and economizers. Other factory-installed options include convenience outlets, non-fused disconnects, motorized two-position dampers, and medium and high-static motor drive. Each Day & Night unit is 100% run tested to deliver today’s best design in quality, energy efficiency and reliability. We take pride in delivering high efficiency and innovative design that exceeds your expectations for comfort every hour, every season. Every Day & Night product is backed by exceptional warranties. Day & Night offer a No Hassle Replacement™ limited warranty on their premium products. That means they replace your unit if the compressor, heat exchanger or covered coil fails within your coverage period. Day & Night also provides extra coverage with a 10-year parts and compressor limited warranty*. Day & Night warranty options are hard to surpass, just like their dependable products. When your heating and cooling system is working properly, your building is comfortable and you’re probably not experiencing any significant increase in your utility bills. So when a part malfunctions or your unit stops working, how do you decide if it’s time to repair or replace it? 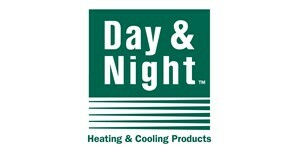 Your local Day & Night® dealer can provide a thorough diagnosis of your system and make a professional recommendation. To help you decide, we’ve put together a list of factors to consider. 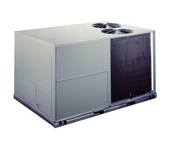 Replacing all or part of a heating and cooling system can be a big investment. When an older unit has continuous issues or shows signs of reduced energy efficiency, it could be more economical to upgrade your HVAC system. A Day & Night dealer can help you diagnose your heating and cooling system, as well as help you choose a replacement that fits your needs and budget. Pollutants are everywhere indoors and are frequently two to five times more prevalent than in outdoor air. Day & Night high-efficiency air purifiers help you breathe easier by treating 100% of the air flowing through your building’s comfort system with their patented technology that both filters and kills or inactivates airborne irritants, such as pollen, pet dander and other air irritants. The summer months bring hot and muggy temperatures in many parts of the country. Day & Night multi-stage heat pumps and air conditioners offer enhanced dehumidification to ensure that extra moisture doesn’t stick around. Day & Night’s efficient furnaces with variable-speed blowers also help pull moisture out of the air during the cooling season. Day & Night® products includes the extra care and technology to create quiet operation for your office or home. From design to operation, sound reduction ensures a comfortable experience with your heating and cooling systems. Day & Night products deliver low decibel sound levels and sound-barrier technology to create a relaxing comfort experience. The Observer wall control allows you to customize temperature, humidity and fan speed in up to six zones of your office or home. The Smart Recovery feature smoothly and efficiently adjusts zones to your customized comfort levels throughout the day and week. Convenience and versatility are key to Day & Night complete comfort systems. Our Observer® wall control with Wi-Fi® capability provides the ideal way to control your home or office comfort from your computer or mobile device. Simply access your Internet browser and log on to our easy-to-use, personalized Web portal that displays just like the Observer control to adjust your comfort. Set your preferred temperatures throughout the week with our Observer® communicating control with advanced touchscreen technology. Our seven-day programming lets you set different temperatures for different times of day for the ultimate comfort control. When you combine a Day & Night variable-speed product with an Observer® communicating control, you have more control over the comfort and humidity in your office or home. Variable speed is different than single speed because it can move air at optimal speeds to keep the temperature in your office or home more consistent, minimize hot and cold spots and also increase efficiency and air quality. Day & Night® products are made with energy efficiency in mind. If your units are 10–15 years old, you may be paying an extra 20% or more than you need to for your heating and cooling. All Day & Night® heating and cooling products currently meet or exceed the DOE minimum efficiency standards. We offer ultra-high efficiency products that exceed the minimum qualifications of the ENERGY STAR program. And many of our product lines are ENERGY STAR qualified with some of the highest efficiency products available today. The total savings of your current system and a new one depend on many factors such as the weather where you work or live, utility costs, your building’s energy efficiency, and your temperature setting preferences. 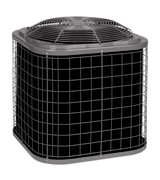 EER: EER stands for the Energy Efficiency Ratio that calculates the efficiency provided by a central air conditioner or heat pump while cooling at a specific outdoor temperature. It can be found by dividing a unit’s Btu output by its wattage. ENERGY STAR® : ENERGY STAR® qualified earn the U.S. government’s designation for superior energy efficiency to help save costs on energy bills.